I must be honest, and say that I’m not feeling particularly ‘Christmassy’ this year. The family’s first Christmas without Mum is bound to be a bit difficult. So things will be kept low-key. I thought you might like a glimpse of one of the cards I made this year. Very simple and easy to make. If you want to use the design, you should be able to use the picture above as a pattern. The fabric is 36 count natural linen (Zweigart Edinburgh). Any relatively fine evenweave can be used instead – you’ll only need a small quantity, so it’s great for using up scraps and offcuts. In this case, a small strip of fabric left over from another project. On this fabric, the stitched area is 6.8cm high by 2.3cm wide. Allow another centimetre all round, before trimming. On coarser fabric, the finished size will be larger. The green/blue threads are two strands of different colours of varigated silk thread from Oliver Twists. (You could use two strands of stranded cotton floss, or anything else that is about the right weight for the fabric.) If your fabric is not as fine, you may need to use more strands of thread. The tree-top stars are worked with two threads of blending filament – I used one strand of gold and one strand of red/green iridescent filament. Any fine, shiny thread would do instead. (I can tell you that blending filament is a real pain to stitch with – it is most disobedient stuff!) 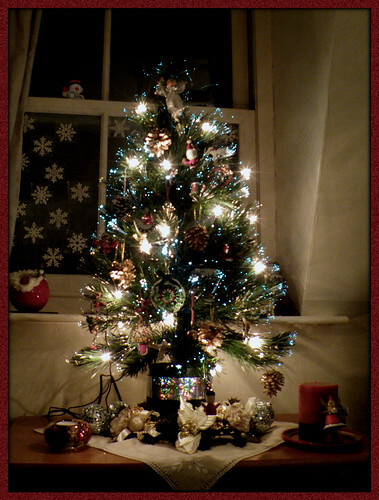 You could also tiny star-shaped sequins, beads or little adhesive stars to trim your tree. For the blanket-stitch edging, I used sewing silk in a slightly lighter shade than the ground fabric. Again, the colour and thread can easily be changed. 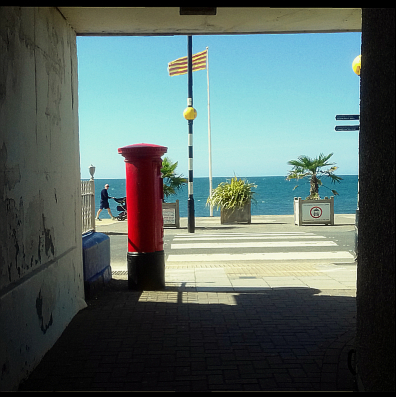 You might prefer to use a bright Christmas red. 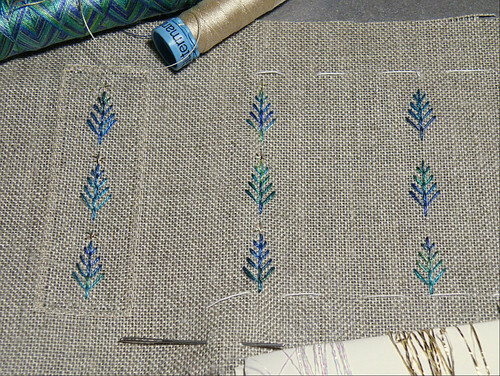 The trees start at the top with a straight vertical stitch over four threads. After that, there are four fly stitches. The loop of the first one is two threads down from the top and two threads out on each side, and the tying down stitch covers four vertical threads. The loops of the other three are each one thread further out and three threads down from the previous stitch. All the tying-down stitches are over four threads. You might want to experiment with different numbers of branches, and different spacings to make trees of different sizes and shapes. There are eight threads left between the base of one tree and the first stitch of the tree below. 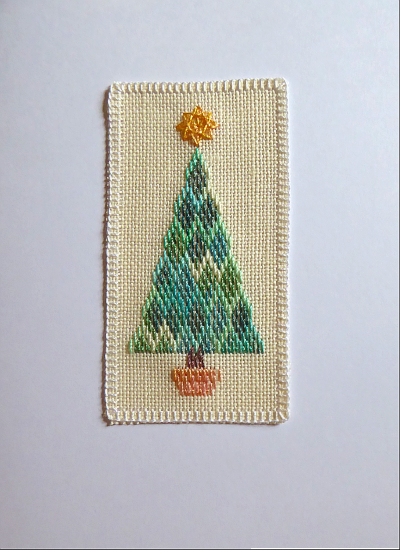 When the trees are finished, add the stars – just three straight sitches of the blending filament, one vertical over five threads, crossed with two diagonal stitches over four. The border is just buttonhole stitch worked over three threads, with three threads between each stitch. (At the corner, you work three stitches into the same inner hole.) I left three threads between the trees and the border at the top and bottom, and it is seven threads beyond the broadest fly-stitches. And that’s it. I cut the fabric six threads beyond the border all round, and then frayed off three threads. The piece is simply glued to the front of the card. (I used PVA glue, applied sparingly.) I mounted it onto a brown-paper coloured card, for a very natural, simple look. A row, or a whole forest, of these little trees would make a nice decoration for table linen. How about white trees on dark green or holly red fabric? Have fun. 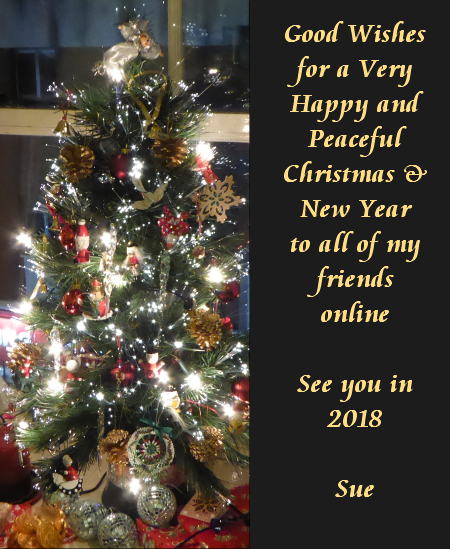 My very best wishes to you all for the holiday season. 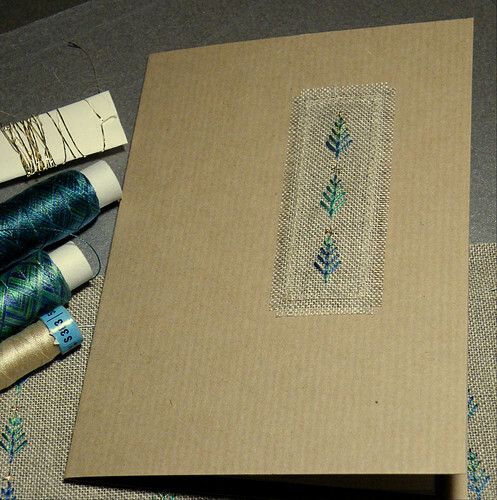 In the new year, I will have some more embroidery projects to share with you, along with other things. Starting with the story of Great Grandfather Thomas the Station Master and his dog. The Christmas tree went up today. I’ve had this one for ten years, since my first Christmas in the Tortoise Loft.